Colormania is a game app developed by Genera Mobil. This unique game will present you with a variety of icons – logos, cartoon characters, even country flags – and a number of colors you can choose from. You are required to pick the colors that correspond to the icon. Some icons require one color, while others require more. I’ve come across icons that are made up of 5 colors (maybe even 6 – I don’t remember any more). One tip I can offer is this: Many of the icons, especially company logos, are either made up of words/letters or have words/letters on them. Simply do a search in Google Images on those words/letters and often you’ll find the icon in full color. Then it would just be a matter of picking out the right color(s) from the available choices. 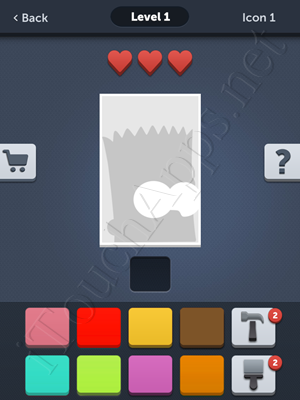 This was how I found the answers for many of the icons in this game. And of course, an even easier way would be to browse the answers I’ve provided below. 😀 You can click any link to see the corresponding picture of the icon, and figure out which colors the icon is made up of. Hope you have fun with this!